People have been perking coffee for over 200 years. It’s a genius brew method that just needs a little hot water, some roughly ground coffee, and gravity to do its thing. The water repeatedly falls over the coffee grounds to brew the coffee and extract the flavor. When used correctly, percolators can make a rich, strong and dense cup of coffee with just the right hint of bitterness (See how to use a percolator). You can find stovetop percolators and electric percolators for camping, while others love them enough to use them daily. Consider some of the following options and check out the FAQs to find out all you need to know before buying the best coffee percolator for your needs. What Does A Percolator Do? Are There Different Types Of Percolators? What Size Coffee Percolator Do I Need? Do I Have To Buy Paper Filters? How Do You Know When Your Coffee Is Ready? Is Perked Coffee Better Than Drip? Most Americans consider a regular cup of coffee to be between 6 and 8-ounces, or enough to fill a mug. This brews eight 5.5-ounce cups (44-ounces), so it works well for a few people at a time. It definitely brews enough for 5 or 6 good-sized cups of coffee, or 7 to 8 smaller ones. As for the electric aspect, there are two issues. Firstly, the cord is really short, so you’re limited as to placement. Secondly, there’s no on/off setting. If it’s plugged in, it is on, and then it will automatically go to the heating mode, you can’t adjust it. If you leave it in too long, you can melt the electrical parts and mess up the built-in thermostat. Also, you’ll get super bitter coffee. 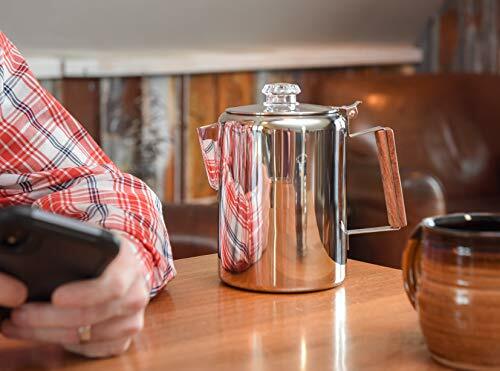 Although made in China, the body of this American-based company’s percolator has no cheap plastic – only glass, wood, and metal. The parts fit together well and are totally safe for both stovetop and fire pit. Just beware the slightly domed bottom, which is nothing a rubber mallet can’t fix. You’ll only get about 4 or 5 regular cups out of this, since the capacity is only 42 ounces. This might be disappointing if you were expecting a huge percolator, which this definitely isn’t. The perk pot comes with flat disc filters that will help keep the grounds out of your coffee. These are specially made for the Coletti Bozeman and can be ordered separately as well. They work wonders for keeping a cup of coffee from becoming gritty. This is a thick and sturdy choice at a very reasonable price. 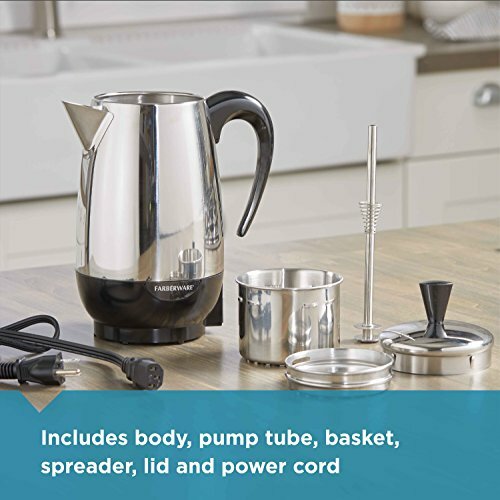 A good starting point for new percolator users, this coffee pot will produce 40-ounces of coffee, which is anywhere from 4 to 8 cups, depending on mug size. It has a unique spout that’s simply a hole in the side with a spout to funnel the coffee into your cup, but that makes it easier to clean if you don’t have a dishwasher. The name and styling indicate that you could use it in a campfire, but that would void the warranty if the pot became scorched. Plus, you run the risk of melting the plastic. You could polish out any marks since it’s polished stainless steel, but I’d keep this one out of the fire and on a grate. This 72-ounce beast is known as a camping champion. It can perk enough coffee for a big camping crew, or less if you need. You can get 8 or 10 cups easily. 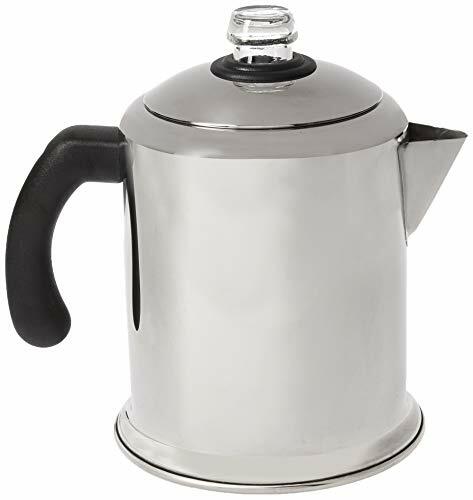 Considering the lower price and the size, the construction is pretty amazing for this percolator. It comes from a reputable camping brand, so you know it’ll be durable. The handle is not the most ergonomic and it gets very hot. Just use common sense and a hot pad. Also, be sure to loosen the glass knob to keep it from breaking and this pot and all parts should last a long time. A big complaint here is the quality. While nice, getting a bent part is a common occurrence. A properly fitting basket, stand and lid is important for the best flavor, so any misshapen pieces can throw off the whole thing. The design of this percolator is wonderful – it looks just like a retro teapot. This pot makes coffee so much more quickly than other models and it has a higher capacity. A great choice for those switching from a drip coffee maker. The plastic is heat resistant, but it’s not super high quality. The knob may break after only a few months of use. In fact, the overall quality and durability of this unit is questionable, which is disappointing at this higher price range. The ready light indicates when the coffee is done, which eliminates guesswork. It also serves as a good reminder to shut off the unit, because if you don’t, you could scorch your coffee and overheat the whole unit. No auto-shutoff or other adjustment settings here. 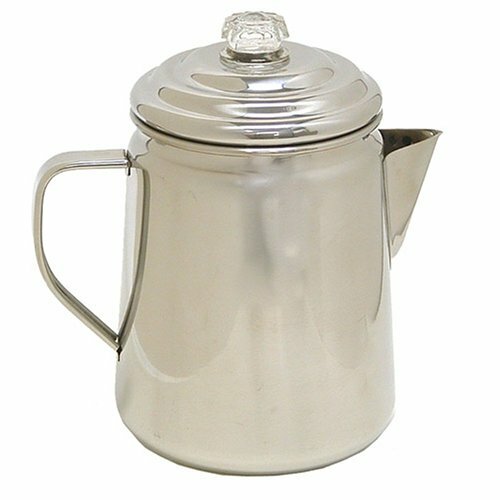 A percolator pot has several parts – the pot itself, a tube/stand, a basket, basket cover, and a lid. The basket and its cover are suspended on the tube/stand over the water in the pot, and the whole thing is covered with a lid. The tube runs from the bottom of the pot to the top of the basket. When the water is heated, the rising water and bubbles will be forced up through the tube and will come out over the coffee grounds. The coffee then drips down and out of the basket and back into the pot. This cycle is continued until the coffee reaches the desired strength. 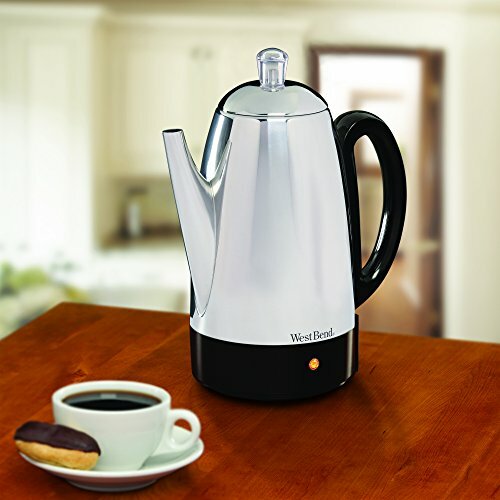 There are two basic types of percolators – a stovetop model, in which you heat the water yourself, or an electric model, which has an electric heating element. Stovetop models take longer to heat but leave more room for customization of flavor and strength. Electric models are fast and convenient, but have shorter lifespans and require a power source. Here are some key characteristics that you should look for in any percolator. Metal and glass parts – these hold up better over time and don’t run the risk of cracking or breaking off. Pure stainless steel – it won’t leach chemicals or unwanted flavors into your coffee. Well-fitted parts – any bent pieces or improperly fitted pieces will ruin the process and result in bad coffee. A loosened knob – a knob that’s not screwed on all the way won’t break from heat expansion. No drip/no splatter spout – make sure the spout isn’t too large or too open, otherwise you’ll be getting sprayed by the perking coffee each time. Depends on how much coffee you drink in a cup. A normal coffee mug is anywhere from 6 to 8-ounces. Camping mugs might be smaller, around 6-ounces. Remember that a large percolator might not brew small amounts so well, so if it’s just you, err on the smaller side. Do you like coffee grounds in your coffee cup? Some people like the added density of flavor and the extra texture, while some people want liquid only in their cup. Most percolator basket filters will let through a little bit of grounds, even if you use larger grinds. You can buy special types of coffee filters for percolators if you decide you want them. Let color be your guide, not time. That’s why the knobs are always clear – so you can see the color of the liquid being brought to the top. Once it’s as dark as you like it, your coffee is done perking. Remember – the darker the color, the stronger the coffee and the richer the flavor. The more times the coffee goes up and over the grounds, the richer the flavor will become. The key with percolators is to do a slower perk, turning down the temperature once the water begins to boil. This helps avoid burned grounds and bitter flavors. A coarse grind works well because it won’t fall through the basket openings. However, larger grinds also provide weaker flavor. You can use any grind as long as you use a filter in the bottom of the basket. Also opt for lighter and less acidic brews to avoid an overly bitter cup of coffee. That’s like asking if green tea is better than black tea. It depends on your palate and your coffee needs! Percolated coffee has a better and richer flavor, but less caffeine. Perked coffee can also be more bitter. Drip coffee is easier to make, but the machine won’t last as long as a good percolator will. I prefer the taste of stovetop percolators, so I would opt for the Coletti Bozeman Percolator Coffee Pot. It’s a large enough size to make coffee for me and my husband, as well as a couple of guests. We can use it at home or at the campsite. It’s well made, with no cheap plastic parts. The included filters save me time and money. I have no doubt that this percolator makes a rich and dense cup of coffee.